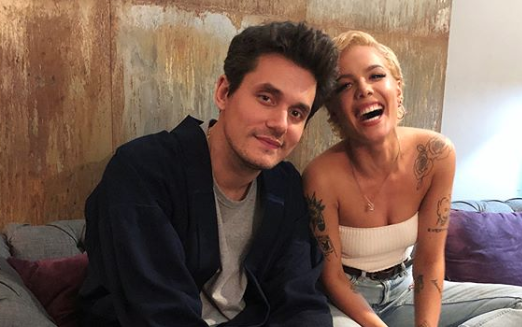 Are John Mayer and Halsey dating? Mayer, who is rocking a sweater and holding a microphone in the video, seems to be intently looking at Halsey. The pair have always been friends, but this little singing situation isn’t the first time they have exchanged some flirty messaging on social media. And what’s more? Halsey just ended her on-again, off-again relationship with G-Eazy, further fueling these new romance rumors. Here’s a couple times the duo have gotten a little cheeky through the years. December 2017: She joked that she hates his guts — especially his appendix — in a photo of them sitting together on a couch. October 7: The cute crooner liked a pic Halsey posted of herself wearing a black bodysuit, writing, “Mine is the ‘like’ of a gentleman.” Halsey did not respond publicly. October 25: Halsey posted a pic onstage and captioned it, “38° F.” Mayer replied, “That’s 276.483 kelvins for you thermal nuts. Ok — so what do we think!? Would they make a good couple?